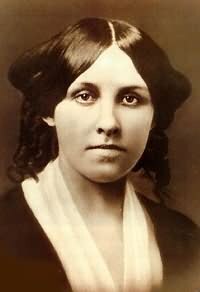 Louisa May Alcott (aged 25, in this photo) was a nurse (in Washington, D.C.) during America's Civil War. A Northerner, Alcott was born in Germantown, Pennsylvania - north of Philadelphia - on the 29th of November, 1832. She grew-up in Boston, then in Concord, Massachusetts (where, for a time, the Alcott family lived in a home called "The Hillside"). 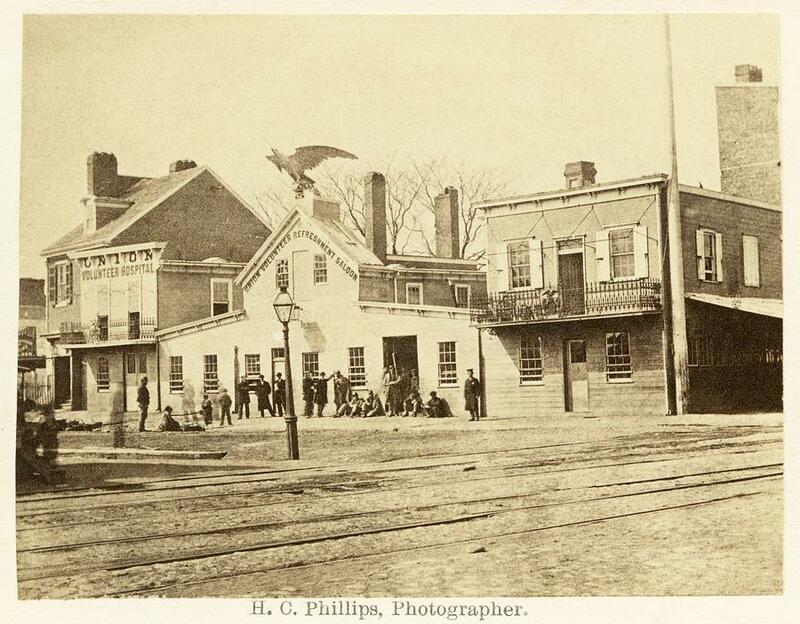 Later, Nathaniel Hawthorne purchased the house, and today it is known as "The Wayside." Soon after the war was over, Alcott wrote her popular book, Little Women. She based her lead character - Jo March - on herself. Jo's sisters (Meg, Beth and Amy) were loosely based on Alcott's own sisters (Anna, Elizabeth and May). I will do something by and by. Don't care what, teach, sew, act, write, anything to help the family; and I'll be rich and famous and happy before I die, see if I won't! ... I will make a battering-ram of my head and make my way through this rough and tumble world. Although she never married, Louisa was very close to a man she met in Europe. His name was Ladislas ("Laddie") Wisniewski and he was, in part, the model for Theodore Laurence ("Laurie") in Little Women. Her character, Jo March - a strong-willed girl - was one of the first young female heroines, in American Literature, to follow her own path. Louisa May Alcott wrote Little Women at her home - called "Orchard House" - between May and July of 1868. She was thirty-five years old at the time. She published the first volume of her soon-to-become-famous book on September 30, 1868. 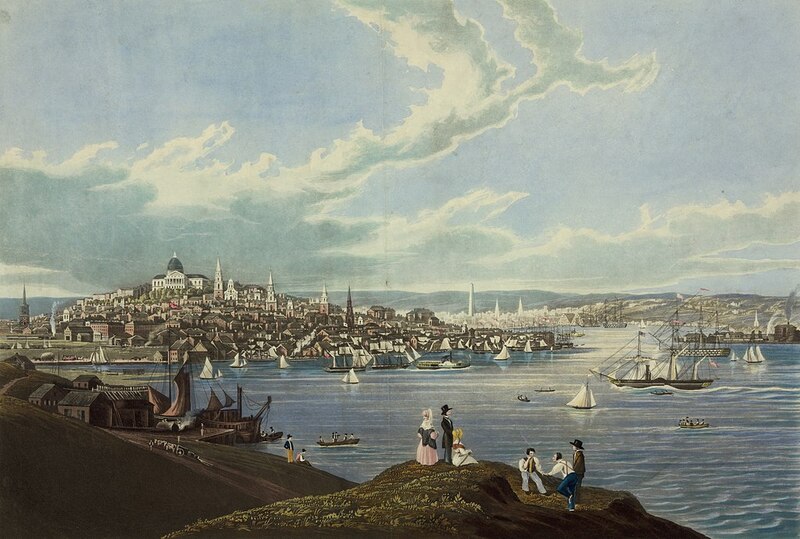 Twenty years later, Louisa died - of a stroke - while she was in Boston. At her death - on March 6, 1888 - she was 55 years old. She is buried at the Sleepy Hollow Cemetery in Concord. In 2003, the BBC sponsored "The Big Read." People throughout the United Kingdom could nominate their favorite novel. After about 750,000 votes were cast - in the year-long process - Little Women was the 18th most-popular book. ISSUES AND QUESTIONS TO PONDER: While listening to the story, ask yourself whether the events in the March home - which took place during America's Civil War - can be compared to family scenes in today's world. What is similar? What is different? When a father is away, at war, what impact does his absence have on his children and his wife? Although the four sisters were worried their father might never come home, because he'd be killed in the fighting, no one expressed that fear outloud. Why not? Are there issues, in your family, which everyone is thinking about but no one discusses outloud? What makes that approach helpful (or not helpful)? Louisa May Alcott was as popular in her day as J.K. Rowling is today. Alcott was able to publish Little Women under her own name, while Joanne Rowling's publishers told her she needed a name change - thus the invention of J.K. Rowling (although the author had no middle name) - before they would publish the first Harry Potter book. What does that fact tell us about "modern attitudes" toward female writers compared to nineteenth-century attitudes? The first lines of Little Women give us a sense of anger seething underneath the surface of the March family home. The sisters didn't like being poor. If you were writing the story today - focusing on the March family's economic situation - how would you write (or rewrite) the story's beginning? Chapter 1 - "Playing Pilgrims"
"But I don't think the little we should spend would do any good. We've each got a dollar, and the army wouldn't be much helped by our giving that. I agree not to expect anything from Mother or you, but I do want to buy Undine and Sintram for myself. I've wanted it so long," said Jo, who was a bookworm. "I know I do - teaching those tiresome children nearly all day, when I'm longing to enjoy myself at home," began Meg, in the complaining tone again. "I''s naughty to fret, but I do think washing dishes and keeping things tidy is the worst work in the world. It makes me cross, and my hands get so stiff, I can't practice well at all." And Beth looked at her rough hands with a sigh that any one could hear that time. As young readers like to know 'how people look,' we will take this moment to give them a little sketch of the four sisters, who sat knitting away in the twilight, while the December snow fell quietly without, and the fire crackled cheerfully within. It was a comfortable room, though the carpet was faded and the furniture very plain, for a good picture or two hung on the walls, books filled the recesses, chrysanthemums and Christmas roses bloomed in the windows, and a pleasant atmosphere of home peace pervaded it. Margaret, the eldest of the four, was sixteen, and very pretty, being plump and fair, with large eyes, plenty of soft brown hair, a sweet mouth, and white hands, of which she was rather vain. Fifteen-year-old Jo was very tall, thin, and brown, and reminded one of a colt, for she never seemed to know what to do with her long limbs, which were very much in her way. She had a decided mouth, a comical nose, and sharp, gray eyes, which appeared to see everything, and were by turns fierce, funny, or thoughtful. Her long, thick hair was her one beauty, but it was usually bundled into a net, to be out of her way. Round shoulders had Jo, big hands and feet, a flyaway look to her clothes, and the uncomfortable appearance of a girl who was rapidly shooting up into a woman and didn't like it. Elizabeth, or Beth, as everyone called her, was a rosy, smooth-haired, bright-eyed girl of thirteen, with a shy manner, a timid voice, and a peaceful expression which was seldom disturbed. Her father called her 'Little Miss Tranquility,' and the name suited her excellently, for she seemed to live in a happy world of her own, only venturing out to meet the few whom she trusted and loved. Amy, though the youngest, was a most important person, in her own opinion at least. A regular snow maiden, with blue eyes, and yellow hair curling on her shoulders, pale and slender, and always carrying herself like a young lady mindful of her manners. What the characters of the four sisters were we will leave to be found out. "Do it this way. Clasp your hands so, and stagger across the room, crying frantically, 'Roderigo! Save me! Save me!"" and away went Jo, with a melodramatic scream which was truly thrilling. "Don't I wish I could go as a drummer, a vivan - what's its name? Or a nurse, so I could be near him and help him," exclaimed Jo, with a groan. "Give them all of my dear love and a kiss. Tell them I think of them by day, pray for them by night, and find my best comfort in their affection at all times. A year seems very long to wait before I see them, but remind them that while we wait we may all work, so that these hard days need not be wasted. I know they will remember all I said to them, that they will be loving children to you, will do their duty faithfully, fight their bosom enemies bravely, and conquer themselves so beautifully that when I come back to them I may be fonder and prouder than ever of my little women." Everybody sniffed when they came to that part. Jo wasn't ashamed of the great tear that dropped off the end of her nose, and Amy never minded the rumpling of her curls as she hid her face on her mother's shoulder and sobbed out, "I am a selfish girl! But I'll truly try to be better, so he mayn't be disappointed in me by-and-by." "I don't remember much about it, except that I was afraid of the cellar and the dark entry, and always liked the cake and milk we had up at the top. If I wasnit too old for such things, I'd rather like to play it over again," said Amy, who began to talk of renouncing childish things at the mature age of twelve. First chapter of Louisa May Alcott's Little Women, read by Carole Bos (creator of Awesome Stories). Bos, Carole "Little Women, By Louisa May Alcott - Chapter 1 - Audio" AwesomeStories.com. Oct 07, 2013. Apr 26, 2019. 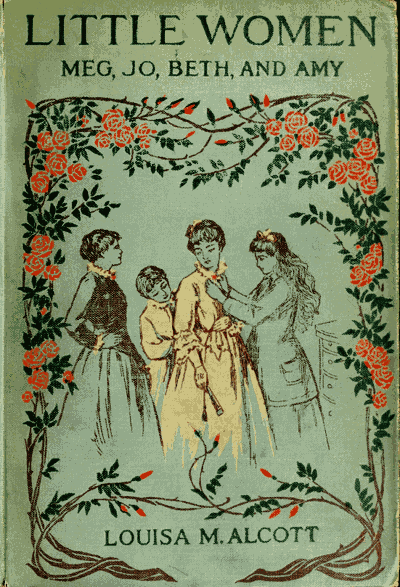 Nineteenth-Century Cover of "Little Women"